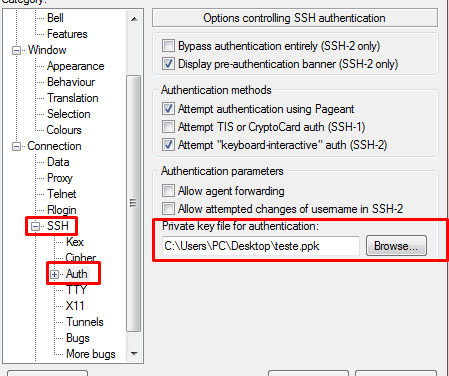 I've been trying to configure the login with a key generated from puttygen so I can disable password authentication. But every time I try to login with my key the server refuses it..
As pointed out by Ulrich Schwarz, .ssh/authorized_keys must be a regular file. In your case, it looks like it's a directory. You need to remove the directory and create a single text file with the key in it. I found the keys generated by puttygen to be troublesome in almost every attempt I made. I am not exactly sure why and how, but the format of the file it generates is not accepted by my Linux and other legacy UNIX systems. enter pass phrase if you want and file names and location too. Then append the public key generated to the end of authorized keys file. Copy (ftp or scp) private key to your PC. Open puttygen and use the import a key option. And on your putty interface, use the newly imported key. Not the answer you're looking for? Browse other questions tagged freebsd sshd or ask your own question.